Bro. 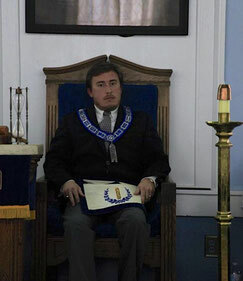 Kyle Barrett Holmes was installed as the Junior Warden of Phoenix Lodge No. 8 A.F.& A.M. on 3 January 2015. Brother Holmes also heads our committee for the NC Masonic Home for Children in Oxford, is active in our building restoration and maintenance committee, and our scholarship committee. In other bodies Br. Holmes is a member of Phoenix Chapter No. 2 Royal Arch Masons, Fayetteville Council No. 27 Royal and Select Masters, and Palestine Commandery No. 20 Knights Templar. He is also a member of Shamrock, Thistle and Rose Council No. 2 Knight Masons.